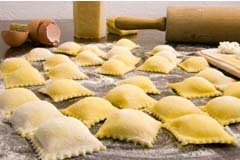 DESCRIPTION: Bring the pleasure and freshness of handmade ravioli into your home with this hands-on ravioli workshop. Does the thought of making ravioli make you a little nervous? Never fear! Freshly made ravioli is surprisingly simple and astonishingly tasty. Once you’ve made your own ravioli, there’s no turning back!